I write to commend Tom, the young man who works for Respitek and delivers oxygen to my home every two week, for EXCELLENT SERVICE. During the entirety of Tom Durfee’s employment in the time I have known him, he has always performed his service quickly, efficiently, completely, and repletely. He has shown an excellent attitude of friendliness, professionalism, politeness and respect. He always protects my floor from possible tracks from the dolly he uses for the heavy oxygen tank. He seems to observe proper precautions against injuring himself or our furniture when handling the tank. He always makes sure I have sufficient supplies and my equipment works properly. Today he tested my oxygen concentrator, found that it needs service, and replaced it with a properly functional unit. He never forgets to present Respitek paperwork to me or my wife for signing. He always smiles and offers a friendly salutation upon arriving and departing. Tom always seems to be in a good mood. Whenever he mentions Respitek or its managers or his fellow employees, he does so with consummate respect and appreciation for their quality and competence. He never acts fresh or nosey, but rather behaves cordially and with grace. To me he seems like a model employee. If I still had a company, I’d feel delighted to have employees and business associates like Tom. He makes Respitek seem like a good company. When you consider pay raises and promotions, I hope Tom finds himself at the top of your candidate list. Thank YOU for employing him and assigning him to service my oxygen equipment. I feel sincerely grateful for Respitek’s EXCELLENT service. Commentary Copyright © 15 January 2014 by Bob Hurt. All rights reserved. Take note of the comments to such articles. Liberal gun haters in the media have cited the incident as a basis for demanding more gun controls. For some insane reason the haters have not demanded more cell phone control. Texting disturbs the concentration and focus of others physically present so that they cannot focus on the event at hand, such as a conversation or an entertainment event like a play, concert, or movie. In other words, one becomes RUDE, IMPOLITE, and DISRESPECTFUL by texting in the presence of others physically present, and that subjects the texter to risk of discipline, ostracism, shunning, banning, and excision. Anyone who feels offended may take any action to stop the behavior or eject the rude texter from the event or gathering. Precisely THAT happened in the movie theater. But texting has become far worse than that. Nowadays I see people texting while driving, walking down the street, CROSSING the street, shopping in stores and browsing in malls, and walking in groups of fellow texters. Teens and adolescents seem to text most avidly of all. If schools did not forbit phone use, students would text one another in the classrooms across America while teachers struggle to impart knowledge to them. Curtis Reeves had previously disciplined others about texting, according to news reports I watched on television. Some might call him a serial complainer/harasser. I call him a good citizen. I believe the time has become long overdue for all people of good sense to JUST SAY NO to texting in polite society. Since this seems like common sense to me, I believe we should routinely insist that people who enter our homes or our group turn off cell phones, and eject any who refuse or who take a call without excusing themselves and leaving the room or premises so that none present can hear or see their interaction with the unknown party on the other end of the phone communication. The only exception occurs when the phone user asks permission of those present, and, so long as none object, to put the phone in loud-speaker mode so all can hear and participate in the conversation. People should NEVER use cell phones in the movie or stage theater during preview, prelude, or performance. And people should never put up any resistance if others remind them of this point of etiquette. Chad Oulson might have learned this point of commonsense etiquette the hard way, had he lived through the ordeal. Had he enjoyed the company of several combative friends, Curtis Reeves might have died in the confrontation. 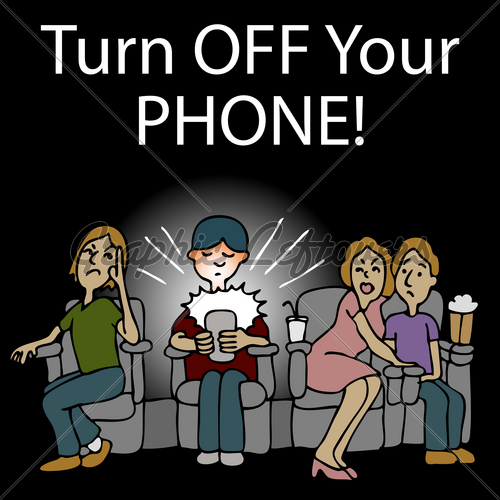 TURN OFF YOUR CELL PHONE BEFORE you enter a theater, church, courtroom, Lawmen meeting, or group gathering or meeting where use of your phone might distract you or others, or become an annoyance. TURN OFF YOUR CELL PHONE BEFORE you sit at the breakfast / brunch / luncheon / dinner table in the company of others. DON’T ANSWER THE CELL PHONE in the company of others or put someone on hold to take another call unless it’s from your spouse, your kids, or any other who might rely on you in a dire emergency. In that case, excuse yourself and leave the area to go out of earshot of the others so you can talk privately. Always ask the host or manager to impose discipline on a violator of cell phone etiquette and give reasonable time for the discipline to take effect before you get personally involved. This means cell phone rudeness has become a plague because so few people impose discipline on the rude. That tolerance has made them even ruder. Always pack heat if you plan to address a rude person about cell phone etiquette. A person who respects your right to remain undisturbed won’t use a phone rudely to begin with. That means you might face violent resistance from those you discipline about etiquette breaches. And that rude person might have friends available for backup. Remember that natural resentment over racial or social differences with the rude might exacerbate the resistance. And such resistance might put you in lethal danger. Cell phone users should realize that the confused resentment over rudeness of cell phone usage, like texting, has occurred because texting seems innocent, innocuous, and unintrusive, even though it does obtrude against others, signaling apathy, insensitivity, and disrespect. Many, in self-defense, respond by texting on their own phones. I often have witnessed groups of young people sitting around with their phones in hand, variously conversing and exclaiming or joking with one another, and then texting or talking on the phone. Perhaps that has become the new etiquette for youngsters, and it seems to have affected their parents. Now people in their 40’s do it, people in their 30’s do it more, people in their 20’s do it a lot, and people in their teens do it virtually incessantly. Texting impolitely has become so widespread as to annoy the holy hell out of people in their 50’s and older. This has the effect of building a welling-up of resentment by seniors against texting in theaters, at the eating table, in mixed company groups, while driving, or while walking around in public. As a result, many seniors have become frustrated, impatient, and out of tolerance for texting, particularly by careless and cavalier youngsters. THAT feeling of intolerant “I’m mad as hell and I’m not going to take it any more” resentment of texting in the mind of Curtis Reeves. And that might have provoked him to protest against Chad Oulson’s texting in the theater. All people of common sense should feel resentment over the disrespect that texters show by texting in theaters, at the table, or in company of others. Imagine what would have happened had a dozen people around Chad Oulson shouted in unison at him to turn off the phone. Probably, he would have turned it off or left the theater, and lived to tell about it, wouldn’t he? Instead, the cowards around him remained silent while Curtis Reeves did their job for them, and now he sits in jail for defending his life with a pistol. Bottom line, I consider the killing tragic but justified. Even if a 71-year-old had the physical ability to prevail in hand-to-hand combat against a robust 43-year-old, getting into a fist fight might cause permanent injury to one who only wanted to enjoy the move free from the distraction of cell phone screen glare from a user right in front of him. No one under attack has the obligation to wait and see whether it escalates beyond control or exceeds the power of one to defend oneself. So, I have absolutely no doubt that the jury will acquit Curtis Reeves, as it should, if his case actually goes to trial. Note that it might have made far more sense for Curtis Reeves to have gathered his witnesses and sued Chad Oulson for disturbing his peace in the theater, and called the sheriff on him to boot, and sued the theater owners and manager for not throwing Chad Oulson out for texting. Then they’d all get to duke it out in court and we could know what the judges think of the matter. Maybe furor over this issue will cause the Legislature will enact a law against texting at public events or in theaters where the texting could distract others. Would you consider that wise? Respect for etiquette prevents fractious interactions. Rogues, thugs, and the unrefined never learn it, and many suffer from it. In the end, people either learn etiquette or pay the price, as the issue at hand fully testifies. Thus, etiquette fully justifies that shooting. Let us pray to God that the rude texters of America learn the right lesson from it: put away the phone out of respect for people and the consequenses of alienating them for texting in their faces. Please distribute this commentary far and wide. Feel free to respond go my blog or by clicking on this Email-Bob-Hurt link. But don’t do it using your cell phone while in a movie theater or at the eating table in the company of others. You don’t want to seem RUDE, do you?